In this cartoon, Thomas Nast emphasizes Horace Greeley's control by Tammany Hall, the influential Democratic political machine in New York City. The cartoonist portrays the presidential candidate as a "Cat's-Paw"-someone who does the dirty work of another, in this case, the corrupt Tammany boss, William Tweed. The term originated in the fable of a monkey who uses a cat's paw to retrieve roasted chestnuts from hot ashes. 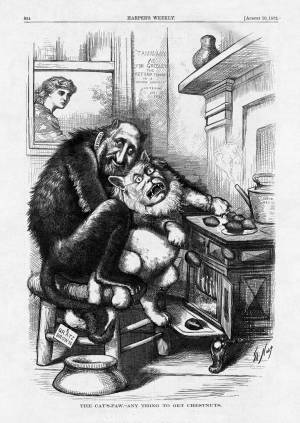 Here, Tweed-the-monkey looks on hungrily as he steers Greeley-the-cat's paw toward the desired "chestnuts" of federal patronage in cabinet departments, custom houses, and other agencies. On the back of the stove, the "Liberal War" teakettle lets off steam. A concerned Columbia peers inside through the window.